Sound "Very even-sounding speakers, extraordinarily so. You wont hear this speaker and say its rich or light, analytical or musical, resolving or graceful. Its all of these"; but "a two-way stand-mounted design can produce only so much bass." Features Ceramic tweeter and Kevlar woofer in a very dense and inert cabinet molded of a fiber/mineral compound; crossover is Speaker Arts proprietary "seventh- and tenth-order series." Use Finding a spot that gives both ample soundstage depth and bass power is important to getting the most from these speakers; subwoofer experimentation is warranted, but only with a sub that does "as little to the sound as possible." Value "Unique" in many ways, including the price for a pair of stand-mounted speakers -- and the beautiful sound. When we at SoundStage! cover an audio show, which we do multiple times each year, we take pictures of a lot of audio equipment. Duh, right? But what you may not know is how much e-mail we get asking us to review one product or another that we've seen, heard, and often photographed at a show. This has happened any number of times, and given that just about every audio company is represented at the CES, covering the show gives us the perfect opportunity to request products for review. 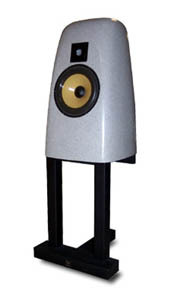 Behold the Speaker Art Proklaim II, which we first encountered at CES 2000. It took a while, but Bob Gross at Speaker Art finally had a pair of the speakers to loan us. Yes, we received e-mail about the speakers, which prompted us to ask for them, but more than this, we wanted to follow up on the sound we heard at CES 2000 from the company that makes the Reviewers Choice Clef loudspeaker. The Proklaim II catches your eye, not because of a gleaming, jewel-like exterior, but rather because of the somewhat pyramidal shape of its cabinet. It looks sort of like a big tooth, although its actually an "Olsen-optimized" shape derived from 16 separate renderings of loudspeaker cabinets by a physics professor. The Proklaim IIs cabinet is cast from a dense and inert fiber/mineral compound and has the feel of stone. Rap your knuckles on the cabinet and youll hear just what you would if you did this on a concrete sidewalk. I suspect a good amount of the Proklaim IIs $9995-USD-per-pair price resides in the cabinet. with uniform group delay across the pass band." The effect? "Extraordinary power response through the crossover region" and "the inherent current-limiting to the tweeter," the latter of which speaks to Speaker Arts claim of never having a tweeter in one of its speakers fail except due to physical abuse. Quoted frequency response is 35Hz-22kHz +/- 3dB. Speaker Art also proclaims the Proklaim II to be 90dB/W/m efficient and a benign 8-ohm load. As I would have guessed given the emphasis Speaker Art places on its crossover, the Proklaim II is not bi-wireable. Around back, other than the single pair of good-quality binding posts, there is a port near the bottom of the cabinet. Each Proklaim II is 23" high, 15" square at the base, 8" square at the top, and weighs 80 pounds, making the Proklaim II the largest and heaviest stand-mounted speaker Ive reviewed. Given the height of the speaker and the size of its base, not just any stands will do. I used a pair of very sturdy 20" stands from Sound Anchors, and these worked ideally. I would strongly suggest springing for these stands if you buy a pair of Proklaim IIs as they are made specifically for the speakers and support their weight and size well. The Proklaim IIs proved to be very unfussy when it came to partnering them with electronics and cables. I first listened to the Proklaim IIs in my smaller system consisting of an Audio Analogue Puccini SE Remote integrated amp, Panasonic SL-S321C portable CD player, JPS Labs Ultraconductor interconnects and speaker cables, and an ESP The Essence power cord. I was in the middle of another speaker review, so there was no other room for the Proklaim IIs, but the speakers showed themselves very well in this system, and took a leap upward in performance when I switched the Audio Analogue integrated with a Mark Levinson No.383 (review coming). Eventually the speakers took up residence in my reference system: Lamm L1 preamp and ML2 amplifiers, Bel Canto DAC1, Mark Levinson No.39 CD player, and PS Audio P300 Power Plant. Interconnects and speaker cables were either TARA Labs Air One or JPS Labs Superconductor2 and NC Series. Power cords were from ESP, JPS Labs, and TARA Labs. At various points I substituted in the Mark Levinson No.383 integrated amp for my Lamm preamp and amp, and the Perpetual Technologies P-1A/P-3A combination in place of the Bel Canto DAC1. Placement of the speakers in my main listening room, which is 24 long by 12 wide, proved to be a matter of finding a spot that provided the right combination of soundstage depth and bass weight and extension. My instinct when I set any speakers up in my listening room is to place them at least five feet from the front wall, which gives a greater sense of depth, perhaps because Im sitting closer to the speakers, but doing this with the Proklaim IIs made the bass sound less powerful than I thought it should. So I moved the speakers back and more toward the corners, which reinforced the bass but lessened the sense of depth. Eventually I ended up with the speakers not quite four feet from the front wall, a foot and a half from the side walls, and toed in so they fired to the inside of my shoulders. This gave plenty of bass "whomp" and sparkle on top while throwing a truly impressive soundstage. One note about coupling these speakers to their stands: The Proklaim IIs are very heavy, and the bottom of each speaker is not smooth like the rest of the cabinet (the cabinets are probably poured into their molds from the bottom, which you wont see anyway). Consequently, using Fun-Tak in an attempt to couple the speakers to the stands was not the ticket because it would not adhere to the speaker bottoms and was pressed very thin because of the weight of the speakers. So I used single sheets of toilet paper to couple speakers and stands (tissue would work too, I suspect), and this worked better than simply resting the speakers on the stands metal crossbars. Once the Proklaim IIs were placed on their stands and spiked, it was not difficult to become lost in the sound they produced. Music flows from these speakers with plenty of detail and ease. "Sweetly focused" sits prominently at the top of my listening notes, and after months of listening to music with these speakers, my initial assessment has not changed. In no region of the Proklaim IIs sound is the sweetness and focus more prominent than the treble. The ceramic-dome tweeter reproduces cymbals and other instruments with lustrous overtone with wonderful delicacy -- never with unnatural steeliness but rather with characteristic "ting" and whisper-like decay. The scale of these elements was always right too, small gestures retaining proper proportion alongside larger, and louder, sounds. Ani Difrancos Up Up Up Up Up Up Up [Righteous Babe RBR013-D] was one of the staple recordings for our blind-listening test conducted at the NRC, and with the Proklaim IIs, the plucked strings of "Im Not Angry Anymore," which I heard dozens of times in Canada, were just right -- softly played but with plenty of sheen and twang. And Difrancos voice, when she lets go, just cut through the serenity of the playing like a flashlights beam in a dark closet. This was some great listening with the Proklaim IIs, even though it was music Id heard over and over again. The Proklaim IIs tweeter also helped in the display of two other strengths of the speakers: soundstaging and retrieval of ambience. These speakers throw a terrifically spacious soundstage, one that bristles with strongly drawn image outlines and lots of space and air. Up Up Up Up Up Up Up, once again, has some diverse placement of musicians and Difranco herself. On "Everest," Difranco is singing in the left channel, and throughout the song, its very easy to pick out instruments a few inches or feet left or right of center or to the extreme outside. In fact, even though the Proklaim IIs were placed less than two feet from the side walls in my listening room, they easy cast images outside of their placement, Los Lobos Kiko [Slash/Warner Brothers 9 26786-2] having some very good examples of this. Proportion is obvious in terms of the Proklaim IIs tonality. These are very even-sounding speakers, extraordinarily so. You wont hear this speaker and say its rich or light, analytical or musical, resolving or graceful. Its all of these, and the delicate balance of essentially all musical attributes is the Proklaim IIs greatest accomplishment. Ive mentioned a few of Greg Browns discs in my reviews, and his chesty baritone was less noticeable over the Proklaim IIs, which, once again, walk the line so nimbly that its easy to forget about the sonic particulars and audio equipment and get lost in the music. I remember listening to Browns Slant Six Mind [Red House RHR CD 98] all the way though, noting the less chesty quality of Browns voice at the beginning of the first track (which is the job of a reviewer) and then not caring about it after that. Audio apathy is a very good thing. Other than a small touch of overall sweetness in the midrange, which is only discerned when the Proklaim IIs sound is compared to that of other speakers, like the Merlin TSM-SE, the mids are very clear and satisfying, able to convey the signature of your electronics in this region. On Clarence Brewers great King Clarentz [HMG 1007], a review of which you can find in our music archives, the vocals were very present with the Proklaim IIs, not due to any added richness but rather because of their inherent neutrality. Ill trot out a reviewing cliché here simply because it fits: I had the sensation of hearing the vocals for the first time. I also wondered what was responsible for this. The cabinet? The crossover? The two-way design? I would guess its some of all of these things. But not everything is perfect with the Proklaim IIs, and you can probably guess what Im about to point out: a two-way stand-mounted design can produce only so much bass. Yes, the Proklaim II uses a bigger woofer than, say, the Merlin TSM-SEs, and its cabinet certainly has a larger volume too. But it is still a "minimonitor," albeit a very large and heavy one, and for less money you can buy floorstanding speakers with larger woofers -- sometimes pairs of them. However, the bass of the Proklaim IIs is not poor by any means. Its expressive and nimble, devoid of excessive weight or overhang. Its roughly equal to that of the Silverline Sonatinas, and deserves the same kind of consideration before you decide to pair the Proklaim IIs with a subwoofer. These speakers sound so good, especially above the bass region, that youll want a subwoofer that will seemingly do as little to the sound as possible, beginning to blend in at, say, 50Hz and extending downward from there. If youve never heard a steady 50Hz signal, youll be surprised how low it is. Limiting the subwoofer to the very lowest bass range will ensure that it wont intrude into the lower midrange and above and should guarantee that your subwoofer wont be noticed sonically, which is goal #1 of adding a subwoofer. On the other hand, I was able to find a place in my room that produced ample bass of high quality from the Proklaim IIs, so experimentation without a subwoofer is warranted. The speaker the Proklaim II reminds me of the most is the Kharma Ceramique 1.0. It has less bass weight and impact, and its perhaps a little more neutral and transparent, but the same "accurate and musical" tag applies. I wasnt able to compare the two speakers directly, so for that I enlisted the Silverline Sonatas, the original version, not the new Mk IIs. The biggest difference is in the overall nature of the sound, the Proklaim IIs sounding supremely balanced -- seductive, resolving, palpable, you name it -- while the Silverlines had more of an obvious tonal signature that leaned toward sweetness. Their bass was more weighty than that of the Proklaim IIs, but it also lacked the tautness and detail, displaying the bit of "play" I noted in my review of the Silverline Sonatinas, but to an even greater degree in comparison to the Proklaim IIs. The Silverline Sonatas are very satisfying speakers, but the Proklaim IIs offered a more sophisticated view of the music, one that, once again, touched on just about every important reviewing parameter that I could think to mention -- and made very involving music too. The Speaker Art Proklaim IIs are probably the most perplexing speaker Ive reviewed. They do everything they do so well that I feel silly to a certain extent when I point out their bass limitations. But on the other hand, they are not cheap speakers either, and I would be remiss if I didnt cast proper light on everything. What you wont have to fret over with the Proklaim IIs is their supreme sonic balance, ability to sound good with a wide range of equipment, and solid engineering. However, whats clear after my time with these speakers is that Bob Gross at Speaker Art is an underappreciated designer. Hes made a speaker thats unlike any other I can think of -- in terms of construction, physical stature, and price -- and more than any speaker I can think of, the Proklaim IIs deserve to be called unique. Give em a listen whenever and wherever you can. Price: $9995 USD per pair.